This project analyzes the characteristics and spatial distributions of motor vehicle crash types in order to evaluate the degree and scale of their spatial clustering. Crashes occur as the result of a variety of vehicle, roadway, and human factors and thus vary in their clustering behavior. Clustering can occur at a variety of scales, from the intersection level, to the corridor level, to the area level. Conversely, other crash types are less linked to geographic factors and are more spatially ?random.? The degree and scale of clustering have implications for the use of strategies to promote transportation safety. 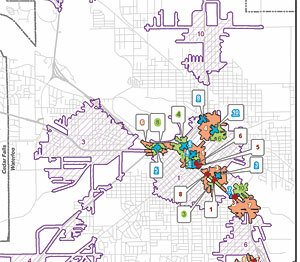 In this project, Iowa’s crash database, geographic information systems, and recent advances in spatial statistics methodologies and software tools were used to analyze the degree and spatial scale of clustering for several crash types within the counties of the Iowa Northland Regional Council of Governments. A statistical measure called the K function was used to analyze the clustering behavior of crashes. Several methodological issues, related to the application of this spatial statistical technique in the context of motor vehicle crashes on a road network, were identified and addressed. These methods facilitated the identification of crash clusters at appropriate scales of analysis for each crash type. This clustering information is useful for improving transportation safety through focused countermeasures directly linked to crash causes and the spatial extent of identified problem locations, as well as through the identification of less location-based crash types better suited to non-spatial countermeasures. The results of the K function analysis point to the usefulness of the procedure in identifying the degree and scale at which crashes cluster, or do not cluster, relative to each other. Moreover, for many individual crash types, different patterns and processes and potentially different countermeasures appeared at different scales of analysis. This finding highlights the importance of scale considerations in problem identification and countermeasure formulation.